Today Bradley Manning was convicted on 20 of 22 counts, including violating the Espionage Act, releasing classified information and disobeying orders. That's the bad news. The good news is he was found not guilty on the charge of "aiding the enemy." That's 'cause who he was aiding was us, the American people. And we're not the enemy. Right? Sgt. 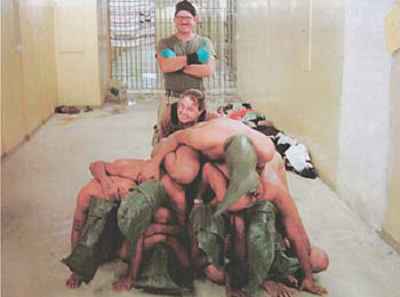 Sabrina Harman, the woman famously seen giving a thumbs-up next to al-Jamadi's body and in another photo smiling next to naked, hooded Iraqis stacked on each other in Abu Ghraib, was sentenced to six months for maltreating detainees. Spc. Steven Ribordy was sentenced to eight months for being accessory to the murder of four Iraqi prisoners who were "bound, blindfolded, shot and dumped in a canal" in Baghdad in 2007. Marine Sgt. Frank D. Wuterich received no jail time for negligent dereliction in the massacre of 24 unarmed men, women and children in 2005 in the Iraqi town of Haditha. Seven other members of his battalion were charged but none were punished in any way.